New e-mails released to The Nation reveal ongoing GOP attempts to suppress the vote. Carly Stumpner, a junior biology major at the University of Wisconsin–Green Bay, had an hour between classes to vote during Wisconsin’s April 5 presidential primary. But when she arrived at her polling place on campus, the line stretched for two hours across the student union. She returned to the polls a second time after her classes, but the line had only grown, and Stumpner had to get to a meeting for work. She wasn’t able to vote because of the long wait times, a frustrating experience for her and many students at UWGB that day. After the primary, leaders of eight different student groups—including the Republican, Democratic, and Libertarian parties and the Black Student Union—asked the city to put an early-voting location on campus to alleviate long lines. But city officials ignored the request and opened only one early-voting site on September 26 for the entire city—the third-largest in Wisconsin—at the clerk’s office, a 15-minute drive from campus, which is open only during business hours. City Clerk Kris Teske, an appointee of Republican Mayor Jim Schmitt, a close ally of Governor Scott Walker, said the city didn’t have the money, time, or security to open an early-voting location on campus or anywhere else. 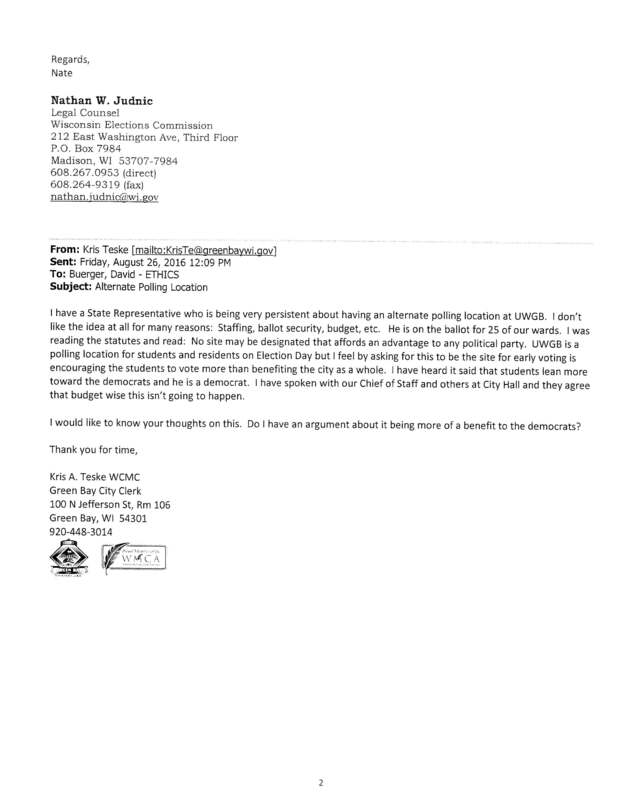 The e-mails were provided to The Nation following an open-records request by the One Wisconsin Institute, which has successfully challenged early-voting cutbacks in the state. As a result of the court decision, Madison opened 11 early voting locations, including at the University of Wisconsin-Madison and Edgewood College, and Milwaukee opened three sites, with a massive increase in hours from 2012. State Representative Eric Genrich proposed opening an early-voting location at UW–Green Bay for 20 hours during the week before Election Day, at a cost of no more than $10,000, which the city had a surplus to pay for, but the city clerk wouldn’t budge. The early voting turnout in Green Bay has so far lagged behind the rest of the county and the state. Green Bay’s refusal to put a polling place at the campus is indicative of the Wisconsin GOP’s broader attack on student voting. Under Wisconsin’s strict voter-ID law, student IDs from most public and private universities and colleges are not accepted because they don’t feature signatures or a two-year expiration date, compared to a ten-year expiration for driver’s licenses. Only three of twenty-six schools in the University of Wisconsin system offer compliant IDs, according to Common Cause Wisconsin. That means many schools, including the University of Wisconsin–Madison, must issue separate IDs for students to use only for voting, an expensive and time-consuming process for students and administrators. To get the new IDs, students also have to bring proof of enrollment from their schools, an extra burden of proof that applies only to younger voters. They must additionally provide proof of residency when they register, which can be difficult for students who live in group apartments and do not have a utility bill or lease in their name. Nikolas Austin, the student-government president at UWGB, led the charge for an early-voting site on campus. He’s a Libertarian and says it shouldn’t matter which party students align with. “It’s not about who people vote for, it’s about them having the ability to vote,” he said. “If I have an exam on Election Day, I can vote early or vice versa. It allows students the flexibility they need.” He’s concerned about what’s going to happen at the polls on Election Day, when more people are likely to show up. Last month, The Nation reported how Wisconsin was systematically refusing to issue the voter IDs people needed to cast a ballot, while claiming everyone was getting an ID. The e-mails from the Green Bay clerk are more evidence of how Republicans in the state are saying one thing publicly while pursuing a different agenda privately. 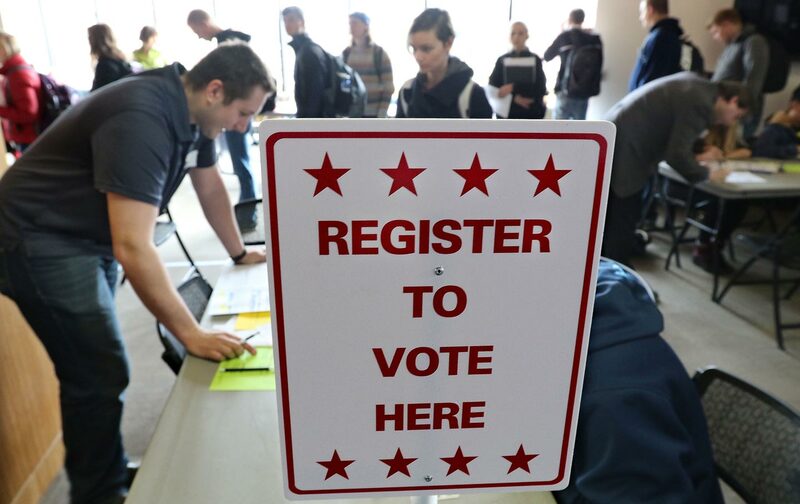 “Voters across the ideological spectrum will be outraged that partisan considerations by a Republican political appointee led to students not getting the access to early voting they would have otherwise,” says Analiese Eicher, program director at One Wisconsin Institute.